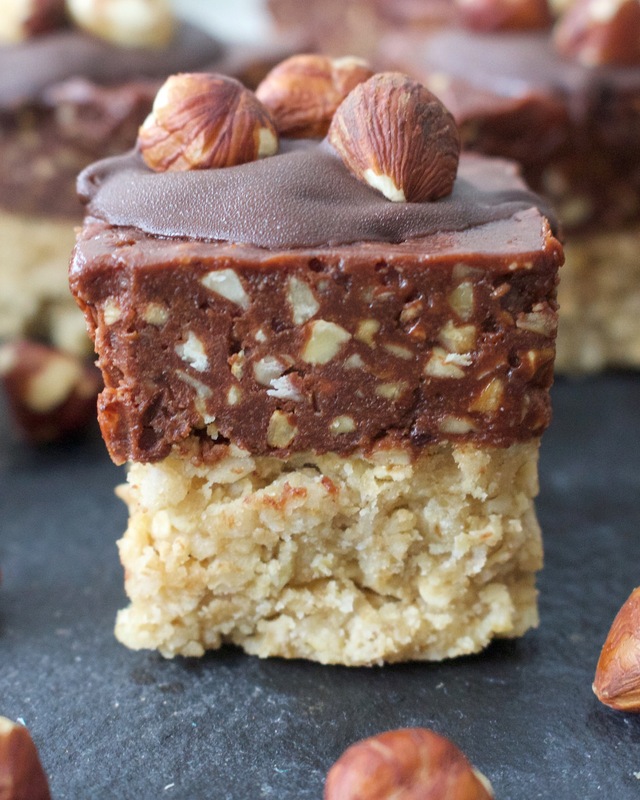 Ok, so it’s official – my no bake flapjacks are definitely one hell of a hit with you guys. And for good reason, they honestly taste like they just floated down from heaven and into my mouth. Yum. And as I firmly believe you can’t ever have too much of a good thing, I’ve come up with another amazing variety for you all to drool over (and hopefully try out) that I’m pretty sure will knock your socks off. 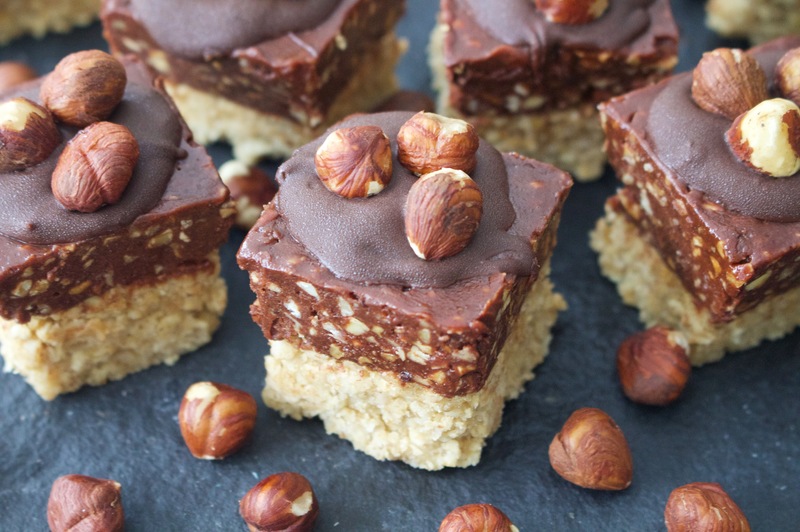 I’ve loved Ferrero Rocher for a long time (see my raw Ferrero Rocher recipe if you fancy recreating a healthy version) so it seemed only right to incorporate their amazing creamy-chocolatey-hazelnuttyness into my irresistible no bake flapjacks to make something simply incredible. 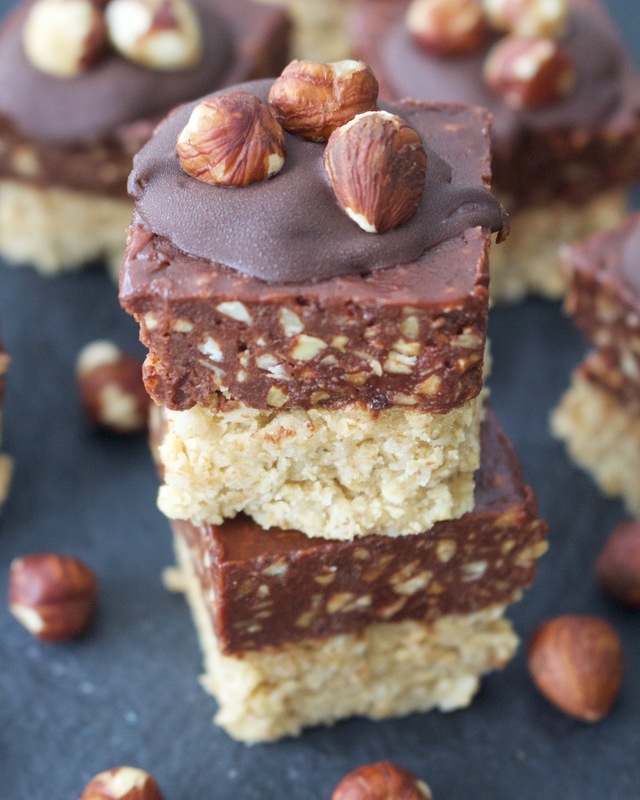 And incredible they are – the crumbly oaty base and the silky smooth chocolatey fudge topping are literally the best combination in the world. And adding hazelnut butter and chopped toasted hazelnuts into the mix? Well I almost feel sad for my past self having lived 29 years without ever having experienced these, but then I just go to the fridge and eat another piece and I feel happy again so it’s all ok. And nothing would make me happier than for you to share with me this indescribable joy, so I think you’d better make them too. Oh and guess what? They still only require SIX INGREDIENTS. For the whole thing. That’s oats, maple syrup, cacao powder, hazelnut butter, coconut oil and chopped toasted hazelnuts. Not a very long shopping list really is it? And you know what’s also not very long? I’ll tell you – the amount of time it takes to make them. 10 minutes tops (maybe 12 if you lick the spoon/bowl like yours truly). So if all of the above doesn’t convince you to make them then I don’t know what will, but I’m off to make some more now…and I think you should too! To make the flapjacks, just combine the ingredients in a mixing bowl and stir well. Spoon into a lined baking tin or mould and press down evenly to make sure the mixture is all compact, otherwise it won’t stick together nicely. Pop it in the fridge while you make the fudge. For the fudge, again just add the ingredients to a mixing bowl and stir until you have a thick chocolatey mixture (don’t worry if it seems quite liquid as this will set in the fridge). Pour it on top of the flapjacks and put them back in the fridge for an hour or so to allow them to set. Alternatively if you’re impatient like me you can always put them in the freezer and they will set quicker. Cut them into squares and enjoy! Oh my gosh!! Why have I never thought of this before? !